Learning how to type with free online tools can enhance your overall typing speed and make you a professional typist. If you currently type 10 words per minute these resources will help you double your typing speed, with practice of course! Taking time to learn how to type equips you with the vital skills to land an online typing job. These tools will not only enable you to type correctly, but also reduce the time that you spend typing. This is a simple site that does not require you to register in order to use its typing tools. It is a typing instructor that is based on flash where you start typing immediately. This tool starts by introducing you to touch typing basic techniques. It moves you from basic typing techniques to complex typing methods. Keybr tracks all mistakes that you make and the number of words that you type per minute. It also provides an overview of your typing on the basis of daily performance. Its features include support for multiple languages, keyboard layout and custom learning modes. This is a straightforward site that tests the typing speed of the user for a period of 60 seconds. After this period, it compares it to your average score. You get a percentile score as well as positional percentile. It features three tests or typing modes and a competition is also included. This tool allows you to play this competition using your preferred language. This tool requires you to register and it starts with interactive tutorials that familiarize you with the keys in the home row. After this, you move on to advanced lessons. This tool also features specialty lessons which entail typing literary classics chapters. Its features include a free portal for teachers, seven languages, and typing games which make learning fun. This may seem like a kids typing tool but it can be used by adults who want to enhance their typing skills. It has different levels with each having three stages. Level 1 is about the typing basics while level 4 is for experienced typists. This online typing tool features songs, dance and music which accompany the lessons. It is a flash-based site. This typing tool requires you to type the lyrics rather than sing along. Using this tool to learn how to type is fun but challenging. The tool arranges songs depending on their difficulty level. The first song can be slow with the others increasing their speed. Basically, there are many free online typing tools that you can use to enhance your typing skill. 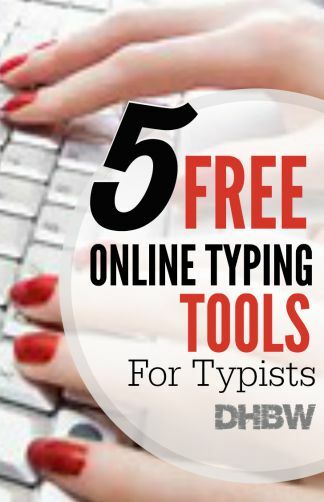 You can start with these top five free online typing tools for typists and they will greatly improve your typing skill.